Email us at Events@RandallGoodden.com if you would like to be on our mailing list for upcoming events! Every year the number of product recalls continues to climb, along with the number of product liability lawsuits filed against manufacturing corporations of all sizes. In the U.S. alone recent studies have shown that there are over 270,000 cases in the courts, and over 80,000 new cases being added annually. Product safety is a major concern worldwide and manufacturing companies need to be in a position to assure their products are safe. Recall costs and product liability verdicts can bankrupt a company or have a long term crippling affect on a manufacturing corporation. You will learn the best procedures for new product development and risk management as well as supplier and subcontractor management and control, key aspects of contractual agreements, recall readiness, and how to recognize day-to-day activities by all the members of the management team that could have a major affect in a product liability lawsuit. The management processes taught at this seminar will lead to significant improvements in operating efficiencies and profitability, and significantly reduce the chances of a product recalls or product liability lawsuits. He spent decades in manufacturing as the Corporate VP of Quality & Reliability, Litigation Management, & New Product Development, and was the Interim President of a large international manufacturing corporation with 8 plants worldwide in 2015. Randall Goodden has served as an Expert Witness in Product Liability cases and has managed Product Liability litigation for clients and hiring the right attorneys for Product Liability, Trademark, and Copyright cases for corporate clients. In April of 2016 the Connecticut Supreme Court wrote to Randall Goodden and asked if he would offer his opinion on a Product Liability case that was before the State of Connecticut Supreme Court, Appellate Court, based on Adequacy of Warnings, which he did. He is the Founder and President of the International Product Safety & Liability Prevention (IPSLP) Association, with over 900 members in over 36 countries, and was the Chairman of the American Society for Quality's Product Safety & Liability Prevention Division for 18 years. Randall Goodden International has been providing these seminars since 1996. Thousands of key decision makers from corporations large and small have already benefitted from these training sessions in the United States, Europe, China, Thailand, Malaysia, Australia, and India, including: Siemens, Dell Computer, Harley-Davidson, 3M, Segway, Panasonic, Rockwell Automation, Motorola, Sony, Shimano, Mazda North America, DuPont, Bombardier, Hasbro, Microsoft, Pitney Bowes, Bridestone, IBM, Cooper Industries, Mead Johnson, Nike, Renault, GE, AO Smith, Dresser Inc, John Deere, Milwaukee Valve, Owens Corning, SC Johnson, McDonald’s, Toyota Motor Thailand, Walt Disney Company, Snap-On, Electrolux, Toys R Us, Simmons Bedding, Kawasaki Motors, Best Buy, Umicore, Effikal International, Honeywell, Coca Cola, General Motors Thailand, Parker Hannafin, BSH Home Appliances, Johnson Outdoors, Alcoa, Shure Inc, Osram Sylvania, L’Inglesina Baby, ITW, Carrier Corp, FMC FoodTech, Sears, Nokia, La-Z-Boy, Steelcase, Sandvik, and TRW, just to name a few of the large number of companies. These seminars are supported, endorsed, and attended by the leading international insurance companies such as Marsh, Zurich, Chubb, Sentry, Travelers, AIG, XL, Hanover, Allianz, CNA, The Hartford, Liberty Mutual, and West Bend Mutual, and equip organizations with the insights necessary to proactively protect against liability risk while improving profitability and reducing insurance premiums. From his decades in executive management as a Corp VP for large international multi-plant corporations and working with numerous other manufacturing corporations worldwide for over 25 years, Randall Goodden can help your manufacturing corporation in a number of critical areas. He has been the Interim President and serves on the Advisory Board to corporations addressing all areas of executive management. Whether it be for an hour, a day, a week, or on retainer, we are more than happy to offer our assistance. Randall Goodden is commonly conferenced in to Board Room meetings, special meeting calls by the leadership team, or coming to your company to work with the management team. We can travel to your site for special meetings, inspections or reviews, and furnish you with recommendations and reports. Let us assist your Executive Team in numerous areas that can help prevent or correct costly business and management issues, and improving efficiencies and profitability. With the growing numbers of product recalls and product liability lawsuits, CEOs need to recognize the importance of ensuring their management teams are making all the right moves and avoiding the potential of financially devastating recalls, or worse yet, catastrophic lawsuits. But these CEOs also need to realize that without the proper training, their management teams won’t know all the right moves, and their corporations could therefore be very susceptible to such disasters. In today’s economy, most corporations can’t afford to take such chances. Randall Goodden has been brought in to teach the management teams at corporations throughout the U.S., Europe, China, and India such as: Siemens, Renault Car Company (Paris), Rockwell Automation, Artsana (Italy), Caben Asia Pacific (China), Ingersol Rand, Brose, Cummins, Kaiser Aluminum, GEA Farm Technologies, ITC (India), ThyssenKrupp, Indesit (Italy), Beckett, Umicore, Shure, CITIC & Nari Technologies (China), AutomationDirect, Douglas Dynamics, HellermannTyton, Milwaukee Valve, Midea Group (China), Haltec, Zurich Insurance & Hanover Insurance, and a large number of other companies. Some manufacturing corporations have rented ballrooms at nearby hotels for such training, and others have held them in their own amphitheaters with management teams up to or over 550 in size, and other corporations have even televised the event to other operations around the world, or flown Mr. Goodden by corporate jet from one location to another to achieve all the training. But one aspect remains constant, CEOs and their management teams continuously say it was the best seminar they ever attended! Download our In-House Brochure In-House Seminar and contact us for more information. Randall Goodden is regularly teaching Quality Improvement, Product Safety & Liability Prevention seminars around the world. The above picture was the audience for his 2-day seminar where over 200 attendees filled the Grand Ballroom of the Changzhou China Grand Hotel. These seminars are attended and endorsed by top officials and agencies in China. 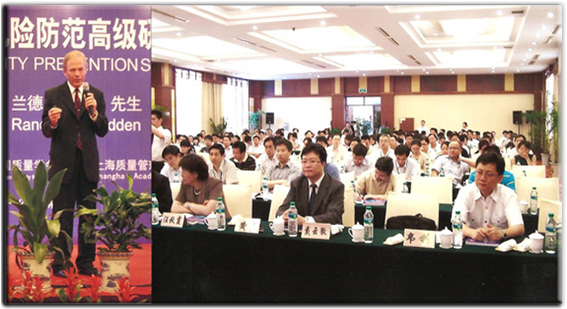 This was just one of many seminars he has held throughout China since 2008. His seminars are routinely held across the United States, Europe & the U.K., Australia, Malaysia, Thailand, India, as well as China. The record number of recalls followed by product liability lawsuits have continued to rise for the past 6 years in the United States, as well as Canada and Europe. At the height of the original crises in December of 2007 Randall Goodden was interviewed by newspapers and magazines all across the country, and was featured on Reuters News, which was shown worldwide. As stated in the interview, many of the recalls from China are not the fault of the Chinese manufacturers, but the fault of the many corporate engineering groups throughout North America and Europe that designed the products. That is why this training is not only a necessity in China, but also in North America and Europe. "Randall Goodden's Product Liability seminar has been one of the best investments of time I have ever made". "The seminar was exceptional and represented one of the highest values of any seminar I've attended in my 25 years in industry". "This seminar was very good, and did what I was hoping it would do which was to describe the product liability landscape in a very comprehensive manner. By having our team attend together, it enabled us to have a common frame of reference which facilitates better dialogue and strategic thinking. I also appreciated the wealth of real cases you were able to draw on to bring home your points". “The knowledge base that our senior managers have acquired from your seminar will definitely change the way we do business. I will indeed recommend this seminar to other corporations in India and abroad”. "The Product Liability Seminar clearly outlined the issues at hand when dealing with product liability. Our company is already starting to use some of the techniques which where outlined at the seminar. I would highly recommend this seminar. Thank you for your help". 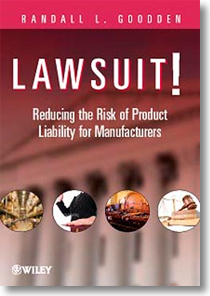 "Your seminar is a real eye opener about the product safety & liability situation in America. I think everybody involved in the design & manufacture of consumer products would greatly benefit from attending it, from assembly workers to CEO's. It definitely changes one's perspective!" "I thought the Product Safety & Liability Prevention seminar was excellent! For me as an oversees Product Safety Advisor, this seminar was invaluable to understand the American system. I certainly recommend those working with product safety, both Americans and oversees, to attend your seminars". Or, if you would rather have your entire management team learn these fundamentals at the same time, and save travel costs, consider holding an in-house Product Liability Prevention seminar, and really increase the knowledge of your organization. These seminars can be the normal 2-day length, or customized to 1-day or half-day versions.